I believe in the kind of Sunday dinner that has to sit on the stove over a low heat for hours smelling up the whole house until it holds the aroma of family. The kind of food that makes people feel like they are home. My favorite way to create this magical smell of home is to make a big pot of braciole, meatballs and sausages in homemade sauce. Meanwhile on another counter… lay out 1/4″ thick slices of top round roast ideally in the neighborhood of 5″ x 7″ (can cut bigger pieces in half.) Season both sides with salt, pepper and a little oil. Give it a little rub down and then set a half slice of provolone on each piece. Next, add a heaping tablespoon of the herb mix on top of each piece of provolone. Roll steaks starting on the thinest end. As you get them rolled up set them seam side down in the hot pan. If you are the skittish type you can secure with a tooth pick. Once they are browned on the one side flip them and brown the other side. Stuff will be falling out by this point. Let that make you happy as this is what will make your award winning sauce. Once they are browned on both sides pull them out, sent them on a plate and move on to the sauce. Add to your dirty pan 1/2 a small onion. Cook 5 minutes till slightly transparent. Add 1T garlic and cook 30 sec. This is the fun part…throw 1/2 c or a bit more red wine in the pan and start scraping the brown bits off the bottom so that they can become one with the sauce. Cook 3-5 minutes till it has cooked down by about half. Then add 2 big cans of crushed tomatoes. Bring to a slow boil and then add back in the braciole with any drippings. You can also add meat balls and sausages at this point. Cook 2-3 hours. By the time it is done the braciole should be fall apart tender. Serve with pasta and garlic bread to loving family members. If you want to serve this to friends that is fine too. It will make them family. 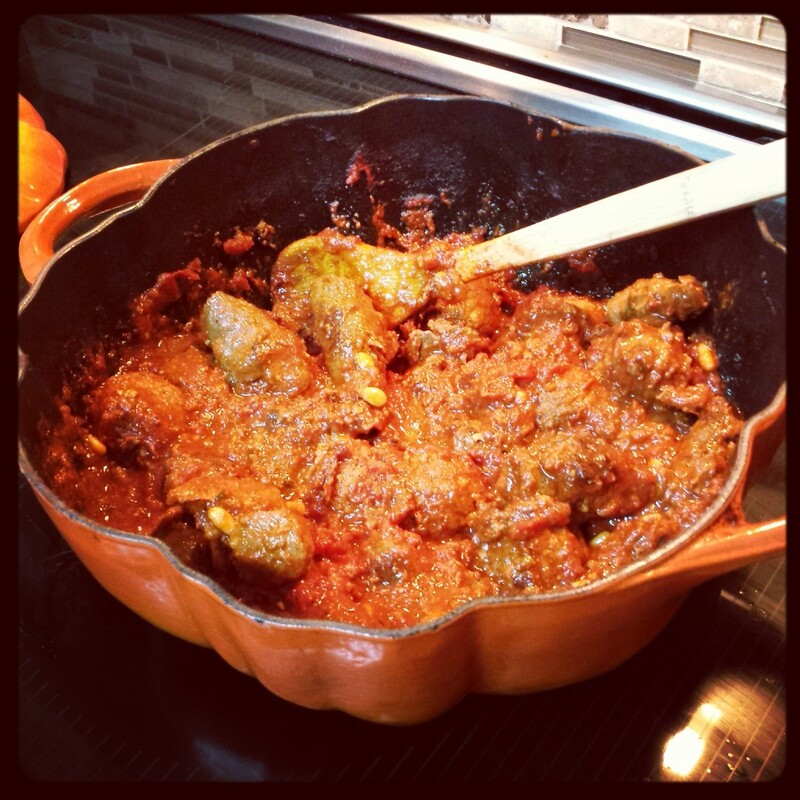 Categories: Good food | Tags: Braciola, Cook, Sunday, Tomato sauce | Permalink.